“Nothing happens. Nothing happens. And then everything happens,” says Laura Lewis, Professor of Chemical Engineering at Northeastern University in Boston, Massachusetts. “Our results are highly preliminary but we have found signatures of layering in the materials we have made.” This is significant, she says, because the layering of iron and nickel suggests that the nanomaterial they are trying to make can become a “supermagnet”. It is designed to be a synthetic form of tetrataenite, a rare magnetic extra-terrestrial iron-nickel alloy found only in meteorites. Lewis is leading a $3.3m (£2.2m) fast-track Department of Energy research project to synthesise new supermagnetic materials and then work out how to mass-produce them for a market that is worth $20bn (£13bn) a year. Supermagnets are the strongest permanent magnets around and are vital for products ranging from head phones to wind turbines and hybrid vehicles. Their strength derives from the fact that they are made out of rare-earth elements which are easy to magnetise and hold their magnetic moments in the solid state, approximately 95 percent of the supply of which is controlled by China. Increasing demand for these elements has led many to fear that the world will soon suffer a severe shortage of them. The British Geographical Survey’s Risk List ranks the threat to the global supply of the metals and other elements necessary for our modern society. 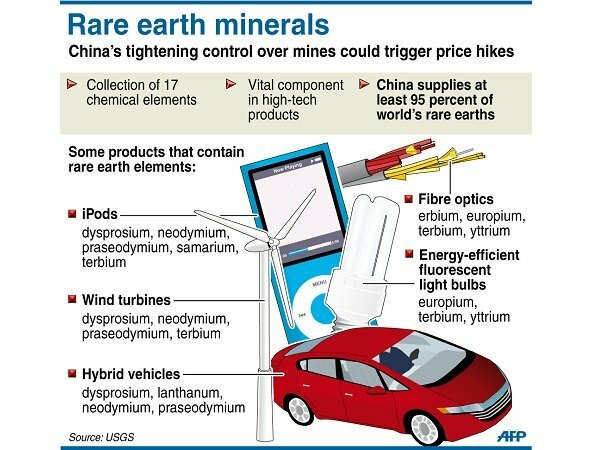 On the 2012 list, the category of rare-earth elements is at the top in red. In comparison, iron and nickel are cheap and easily available. So it is not surprising that for Lewis “it would be huge if we could make supermagnets without REMs [rare-earth metals]”. There are more than 40 elements or element groups that have economic value on the British Geological Survey’s Risk List. Rare-earth elements comprise the 15 lanthanides, spanning atomic numbers 57 to 71, plus scandium and yttrium, which have similar properties. They are particularly important because they are found at the heart of the new technologies and clean energy that the world is increasingly relying on. Most of them are actually not that rare, but they are difficult to mine and expensive to extract as they are often found widely distributed through the Earth’s crust in small quantities and often mixed together in the same mineral. Using them in the manufacturing process is an expensive, energy-intensive process as well, which doesn’t sit comfortably with the need to go green. These elements have an additional complication as well: China. China has been able to corner the market in the supply of these elements because some of the largest deposits of rare-earth elements in the world are found in Chinese territories. For example, the world’s single largest rare-earth element deposit is at Bayan Obo in Inner Mongolia, while almost as large deposits are found in south-west China as well. And China — perhaps like any other country that has found itself in a similar situation — has not been afraid of using this to its advantage. In the last decades of the 20th century China was accused of dumping [.PDF] to drive mines in other countries, such as the Mountain Pass rare earth mine in California, out of business. Mountain Pass used to the world’s leading supplier. More recently the Chinese have been accused of restricting exports and even banning them to force up the price of rare-earth elements or make manufacturers relocate to China. It was reported — though denied — that China banned the export of rare-earth elements to Japan during a confrontation back in 2010 over the fate of a fisherman. According to Richard Shaw, Economic Geologist at the British Geographical Society, rare-earth elements score the top mark of 9.5 on the Risk List because in part of this concentration of production and reserves in the hands of one country but also their “lack of substitutability” which matters because “they are often the best things for the job” and “their recycling rate which isn’t that high”. However, the Risk List is snap shot of the supply situation for this year and not a prediction for the future. Rare-earth elements are joined on the list by many other rare elements such as tungsten, platinum and indium. According to the British Geological Survey, China is the leading producer of 22 out of 41 elements listed. According to David Shuh, Senior Staff Scientist at the Lawrence Berkeley National Laboratory in California, “China recognised the opportunity 30 to 40 years ago and wanted to be the world’s number one supplier of rare-earth elements”. China’s control is, he believes, “particularly vulnerable” to innovation. So with US government support the Mountain Pass rare-earth mine in California, which is sitting on top of about 13 percent of the world’s supply, has just reopened, after closing in 2002 when the price of the elements fell too low. Mines are also starting production in such countries as Australia and Canada. Even once-defunct Cornish tin mines are now reopening thanks to the presence of rare materials such as indium in their tin deposits. In the US the Department of Energy is sponsoring 13 other research projects like Laura Lewis’s to find synthetic replacements for rare-earth materials. Professor Lewis says that because rare-earth elements were “messy to dig up and required strong, damaging acids to separate elements from the rocks the world was very happy to have it restricted to China and not in their own country”. Now she is under pressure to “invent the material right now” and at the same face the “daunting challenge” of working out how to manufacture the new material before the research has even been finished. Meanwhile in Oxford, Professor Peter Edwards, Head of Inorganic Chemistry at the University of Oxford, is leading a consortium of British companies that are looking at using materials such as silicon-doped zinc oxide to use as a substitute for indium and at the same time replace certain manufacturing processes as well. If the consortium can successfully pull off the replacement and manufacture of indium in the five years they have proposed to the government then “the UK will have a whole new industry”. Indium is valued as an element because of its near-ideal combination of high visible-light transparency and high electrical conductivity, which is used in products from solar photovoltaic cells through to touch-screen computer displays. China produces more than half of the world’s supply. Zinc, like iron and nickel, is much cheaper and more available. “Indium is reference 1 [what everyone has to match] as it is highly conductive, very transparent and easy to use, but pricy to make,” says Edwards. “While some people argue about just how scarce it is, it is on the list of elements produced by UK and other European governments that tells us we should be looking for alternatives soon. Companies are certainly hoarding it, which is hitting the price. He adds that the Chinese, from their perspective, are “doing just what any other country would do”. Half of Edwards’ team is Chinese. “However, running alongside the desire to substitute indium is the desire at the same time to see whether we can use it in manufacturing in a different, less energy-intensive way. In the end the success of it as substitute comes down to the usual trade off between price and performance. Lewis doesn’t underestimate the challenges of her project that lie ahead.